In this series on the writing of a novel, it’s important to remember that none of these steps happen in isolation. All of them work together to create a cohesive blueprint on which to expand a new novel. 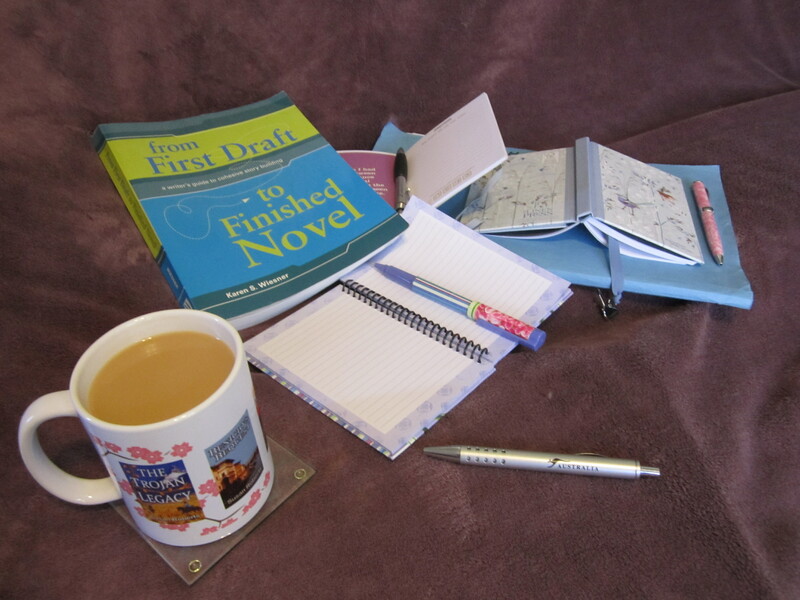 Today’s post takes a look at the first foray into the actual writing of the proposed novel: the first draft. The initial decisions about setting, characters and synopsis all form part of what I call the set-up stage. Construction of the outline, or chapter breakdown, and the timeline would be the first part of the drafting stage. Drafting is the longest stage in the creation of a novel, because each draft needs to be a newer, better version of the same thing. The number of drafts not only varies between writers, but can vary between each writer’s own work. Looking back on my own novels, I can see that my first (unpublished) novel had no real direction at all. I stewed over that for years, trying to polish a mediocre sow’s ear into the silk purse it just wasn’t. So many versions existed on my hard drive and none of them were an improvement on the previous effort. Likewise my second (unpublished) novel was poked at and prodded for several years with no real improvement because the original plan was lacking something I couldn’t pinpoint. I finally hit my stride after doing a creative writing course which gave me new hope and direction, because it sorted out my writing process. This was while writing my novella From Daisy with Love. The most valuable suggestion I received after that course and novella were completed, was that I should write a completely new work instead of constantly trying to fix the two old novels on my hard drive; works that were really only practice runs. After that my work became more streamlined and for my next novel I began to work on the system which I have documented in this series on The Anatomy of A Novel. I think it’s important here not to become too obsessed with composing a winning first line or a stunning opening paragraph. It’s only a draft and, as the great writers tell us, you can edit a bad draft, but you can’t edit a blank page. South African writer John van de Ruit once told me that he (figuratively speaking, of course) vomits it all onto the page first, then he sorts out the diced carrots from the peas afterwards. I couldn’t have said it better myself. He’s a better writer than me, so listen to him because he’s right. Get it down so that you have something to work on when you’ve finished that first draft and are ready to start on the next. There will be millions of tiny changes along the way, and the first draft is not the place to get all pedantic about sentence structure and perfect literary prose. There are more important things to fix in a first draft. For me, fixing the story is of prime importance long before I think about subtle nuances of mood, emotion and sparks between characters. A first draft is just that: a draft. The first of several. Despite being a planner, a plotter, and an outliner, I can still get part way through a draft and decide that something is not quite right and needs fixing. This is very often a question of pace and progression. For example, it’s pointless writing a detailed four-page scene describing a meeting between two characters, if there’s a chance that the scene may later be cut. The scene may be beautifully written, but if it doesn’t serve the story by revealing character or moving the plot along, it is nothing more than dead wood. If the pace is too slow or the progression of the plot over those four pages is minimal, then the scene may not be needed. Don’t just keep the scene because you enjoyed writing it. It’s the thought of all that waste of beautifully written prose that inspires the phrase “to kill your darlings.” The worst reason to keep a scene in a novel is because you loved writing it and it’s one of your favourite scenes. Better to have written a skeleton of it in your outline, or a few paragraphs in your rough draft, that can easily be cut down or removed altogether. It can also later be expanded if the plot calls for it to be a more revealing or pertinent scene. Sometimes a first draft reveals major plot holes that weren’t visible in the synopsis or chapter breakdown. Better to fix a problem that stretches over a few paragraphs, than one which runs to several pages. Perhaps the best thing of all about a first draft is when your gutsy characters begin to react to your plot in a way that is true to their characters, but not to the plot you are trying to manipulate them into. Suddenly they want to do something different from what you had planned. This will mean a major re-working of the synopsis, the outline and possibly a different outcome for the novel itself, but that’s the fun of writing. What else would a writer do without the excitement of creating a new work that surprises even its own author?